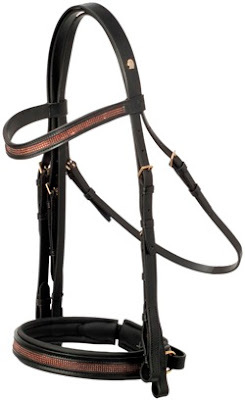 Finally, who puts patent leather on a bridle? Well, actually, black is a maybe. But purple? Wait, didn't we go through this before with you and the orange inset bridle? Actually, I like the trend towards more color in clothing and tack. It's a nice break from black and white. Stacey says: "....who puts patent leather on a bridle?" and I say, "just visit the tack room of any saddleseat barn and then you'll know who puts patent leather on a bridle". Yup, my OTTB and I were in an all-saddleseat discipline barn for awhile and boy was I ever in for a shock, from the "patent leather" bridles as well as other interesting differences, those riders sure know how to "command" attention! I must say though, I really do like the "mesh" look but I'll bet I wouldn't like the price tag so much! Do you have any advice for us? Any good previous articles I should check out? I'm going to look back at old entries in your blog. I know how great a mommy you've been to Riley, so I'm looking for inspiration! I think you're going to need the meth to buy that purple bridle! :) I would think there would be a lot of Saddlebred comments, if anyone showed up to their barn/ a show with that on their horse's head. As an aside, in the NE FL circuit, where we used to show, there was a trend at a jumper barn to show in western headstalls (with horsehair tassel-thingies) and no cavesons. Blech! Purple biothane is my favorite! Photo here: http://tiny.cc/52ykj about halfway down the page. Dresage and saddleseat are becoming similar. I think I just threw up a little. Have you seen Stubben's hunt bridle? Very plain, with the old fashioned wide caveson? Yeah, that is what my Holsteiner is sporting. She looks classic. I think the saddleseat folks wear patent leather boots too. OMG I LOVE that last one!! My first and primary discipline is saddleseat, but this is a little much! Typically our patent leather isn't quite so big or bright. Saddlebreds commonly use red or maroon; other breeds use a little more variety. I have TWHs and once-upon-a-time horribly gaudy rhinestones were "in" and actually were made against the rules they were so bad! As a comment above said, some people do wear patent leather boots, but at least those are ONLY in black or occasionally brown.